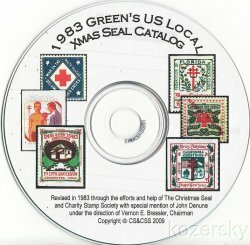 Green's Catalog, TB Seals of the World, Part 2, U.S. Local TB Christmas Seals, Part 2, 1983 ed., CD. U.S. Local TB Christmas Seals, and accessories such as bookmarks, booth envelopes, package inserts, bonds, and posters. Print your own catalog. Green's Catalog of Tuberculosis Seals of the World, Part 2, U.S. Local TB Christmas Seals, 1983 ed., CD. U.S. Local TB Christmas Seals, and accessories such as bookmarks, booth envelopes, package inserts, bonds, and posters. Published by the Christmas Seal and Charity Seal Society (CS&CSS), 2009. 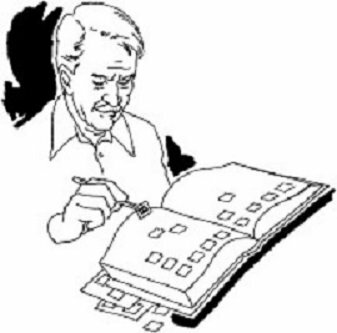 Pdf files, black & white copy quality images, 87 pages, with MS Word cover. Print your own catalog. Requires MS Word and ink jet printer. Software is Non-Refundable and Non-Returnable. However, we will replace the CD if damaged in shipping.